Background and objectives: Transplant “tourism” typically refers to the practice of traveling outside the country of residence to obtain organ transplantation. This study describes the characteristics and outcomes of 33 kidney transplant recipients who traveled abroad for transplant and returned to University of California, Los Angeles (UCLA) for follow-up. Design, settings, participants, & measurements: Posttransplantation outcomes were compared between tourists and a matched cohort of patients who underwent transplantation at UCLA (matched for age, race, transplant year, dialysis time, previous transplantation, and donor type). Median follow-up time was 487 d (range 68 to 3056). Results: Compared with all patients who underwent transplantation at UCLA, tourists included more Asians and had shorter dialysis times. Most patients traveled to their region of ethnicity with the majority undergoing transplantation in China (44%), Iran (16%), and the Philippines (13%). Living unrelated transplants were most common. Tourists presented to UCLA a median of 35 d after transplantation. Four patients required urgent hospitalization, three of whom lost their grafts. Seventeen (52%) patients had infections, with nine requiring hospitalization. One patient lost her graft and subsequently died from complications related to donor-contracted hepatitis B. One-year graft survival was 89% for tourists and 98% for the matched UCLA cohort (P = 0.75). The rate of acute rejection at 1 yr was 30% in tourists and 12% in the matched cohort. Conclusions: Tourists had a more complex posttransplantation course with a higher incidence of acute rejection and severe infectious complications. The demand for kidney transplantation continues to increase (1,2). Some patients opt to explore the option of kidney transplantation outside their country of residence (3). In the United States, the implications of this practice, often termed “transplant tourism,” remain largely unknown. The observation of an increasing trend of patients who return from transplantations that are performed abroad led us to review the experience and outcomes with transplant tourism among patients who were followed in the UCLA Kidney Transplant program. We describe the characteristics and posttransplantation outcomes of patients who sought a transplant abroad and then returned to be followed at UCLA. We identified all living- and deceased-donor kidney transplant recipients who were followed at UCLA and underwent transplantation outside the United States as of April 2007 using the UCLA kidney transplant database. Patients who had moved to the United States after having a kidney transplant and nonkidney transplant recipients were excluded. One recipient of a kidney-pancreas transplant was identified. We used the term “tourist” to describe residents of the United States who underwent transplantation outside the United States and then returned to the United States for follow-up care, keeping in mind that we did not know all of the circumstances surrounding the recipients’ reason to pursue a transplant abroad. Recipient race was categorized as per the Organ Procurement Transplant Network/United Network for Organ Sharing candidate and recipient registration forms (4). Overall allograft survival was determined from the date of transplantation until death or return to dialysis; patients were censored at the end of follow-up. Demographic recipient data; donor data (when available); transplant data (when available); and clinical events and outcomes including graft loss, patient death, acute rejection, serum creatinine measurements after transplantation, and infectious events were obtained using chart review. Patient data were verified with transplant staff and physicians, but patients were not directly questioned with regard to their transplants for the purpose of this study. We first compared recipient and known transplant characteristics between tourists and all adult patients who underwent transplantation at UCLA during the study period. Overall graft survival, patient survival, incidence of acute rejection at 1 yr, and serum creatinine 1 yr after transplantation were compared between patients who underwent transplantation at UCLA and tourists. Using the UCLA transplant database, we then identified a matched cohort of 66 adult patients (>21 yr) patients who underwent transplantation at UCLA during the study period, matched 2:1 with tourists for the following characteristics: Recipient age, race (Asian versus non-Asian), transplant year, previous transplantation, dialysis time, and donor type (living versus deceased). Overall graft loss, patient death, acute rejection, renal function, and infectious events were compared between tourists and the matched control subjects. Donor, recipient, and transplant characteristics were described using means ± SD or frequencies. Comparisons between groups were made using the t, Kruskal-Wallis, χ2, or Fisher exact test, as appropriate. Graft survival rates were estimated by the Kaplan-Meier product limit method, and the test for equality of survival curves was performed using the log-rank test. Propensity scores were calculated using logistic regression and were used to match the 33 tourists to 66 patients who underwent transplantation at UCLA. Comparisons with matched control subjects were performed using conditional logistic regression (using the clogit command). All P values were two-tailed. All analyses were conducted using Stata 9.0 (Stata Corp., College Station, TX). We identified 44 patients who underwent transplantation outside the United States and were subsequently followed at UCLA. Nine had immigrated to the United States after undergoing transplantation in their native country; therefore, 33 patients who had obtained a transplant abroad were residents of the United States. Twenty-nine of these individuals had been evaluated at UCLA before obtaining a transplant abroad. No pretransplantation data were available for two patients. Transplant tourism was more common in recent years, with 67% of tourists having undergone transplantation between 2003 and 2007 (Figure 1). Demographic data for tourists and all adult patients who underwent transplantation at UCLA during the study period are outlined in Table 1. Tourists included mostly patients of Asian ethnicity and had a shorter median dialysis time before transplantation compared with patients who underwent transplantation at UCLA. Characteristics of the matched cohort are also outlined in Table 1, demonstrating that the tourists and the matched group were well matched. Numbers of transplants tourism cases over time. Table 2 outlines the number of transplants performed in each country and the reported ethnicity of the transplant recipients. Most patients underwent transplantation in China, Iran, the Philippines, and India. Pakistan, Peru, Egypt, Turkey, Mexico, and Thailand accounted for a single transplant each. All but five patients traveled to regions of their ethnicity for transplantation. Donor information beyond that of donor source was provided for only five patients, with donor age provided in three instances and HLA matching provided in two instances. Figure 2 illustrates donor type by transplanting country. With the exception of nine (27%) deceased-donor transplants performed in China, all transplants were living-donor transplants. The majority of these were reported as living unrelated donor transplants (61%), but the nature of the relationship between the donor and the recipient was unknown in most cases. 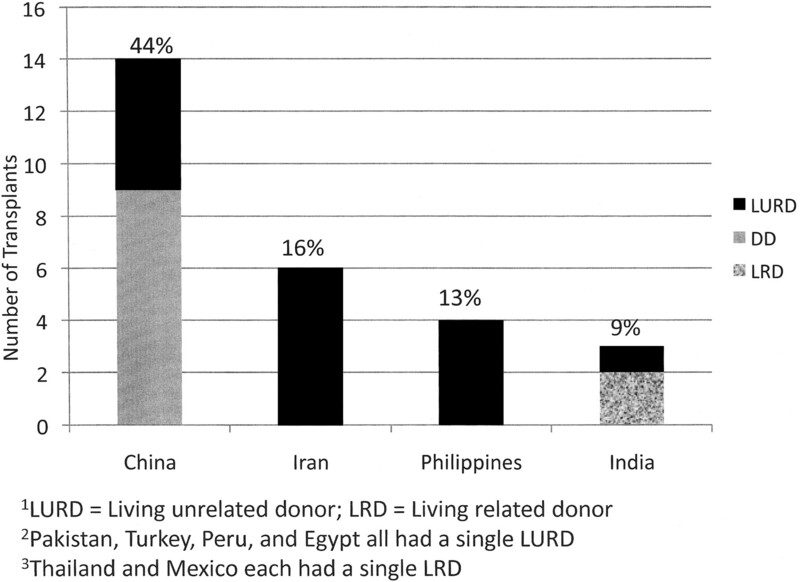 Four (12%) living-related donor transplants were performed in India, Mexico, and Thailand. Of the living-related donors, two were cousins, one was a sibling, and one was unknown. Number of transplants by donor type and transplanting country. LURD, living-unrelated donor; LRD, living-related donor. Pakistan, Turkey, Peru, and Egypt all had a single LURD. Thailand and Mexico each had a single LRD. The median duration of hospitalization was 15 d; however, duration of hospitalization was unavailable for 15 (47%) patients. All patients were discharged on a calcineurin inhibitor; prednisone; and mycophenolate mofetil (90%), azathioprine (7%), or rapamycin (3%). Eight patients received induction therapy, and only 12 patients were reported to have received prophylaxis with sulfasoxazole/trimethoprim and four patients received cytomegalovirus (CMV) prophylaxis. Donor CMV status was unavailable for all patients. Outcomes after transplant for tourists and patients who underwent transplantation at UCLA are outlined in Table 4. The median time after transplantation to initial visit at our center was 35 d (range 13 to 2769), and the median follow-up time was 487 d (range 68 to 3056). Three patients required immediate hospitalization, two of whom ultimately lost their grafts and required a transplant nephrectomy. The third patient had a complicated course with Gram-negative sepsis but retained allograft function. A fourth patient was first seen on admission to the intensive care unit (ICU) at UCLA 5 mo after transplantation with renal failure and fulminant hepatic failure. Overall 1-yr graft survival (GS) and patient survival (PS) were not statistically different between tourists (GS 89.3%; PS 100%) and patients who underwent transplantation at UCLA (GS 94%; PS 96.4%); however, among the cohort of 66 matched UCLA patients, only a single graft loss and no deaths were reported during the follow-up period. Meanwhile, four tourists had allograft failure, and one of these patients died. The median time to graft loss for these patients was 132 d. The circumstances surrounding these four cases are outlined in Table 5. Tourists had a higher cumulative incidence of acute rejection in the first year after transplantation (30%; n = 10) compared with patients who underwent transplantation at UCLA (15%; P = 0.02) and the matched cohort (12%; P = 0.2). No episodes of hyperacute rejection or primary nonfunction were reported. Three patients were reported to have an early acute rejection (before discharge from hospital after transplantation) and were all treated at the transplanting center. One of these patients (Table 5, patient 2) did not regain renal function and subsequently returned to the United States, where he was initiated on hemodialysis and underwent allograft nephrectomy. Five patients had an acute rejection within the first 6 mo of transplantation after discharge, with one patient not regaining renal function (patient 1). Three additional patients had an episode of acute rejection between 6 mo and 1 yr.
One patient (who received a deceased-donor kidney in China) was reported to have experienced delayed graft function and required dialysis for 3 wk after transplantation. This patient had a prolonged hospitalization in China as a result of anemia but ultimately regained and retained stable renal function. The mean serum creatinine levels at 1 mo, 6 mo, and 1 yr after transplantation were not significantly different in tourists compared with all patients who underwent transplantation at UCLA and the matched cohort. Infectious complications are outlined in Table 6. The overall incidence of an infectious event was not different in tourists compared with the matched cohort of UCLA patients; however, the severity and types of infections were markedly different. Seventeen (52%) tourists had at least one infectious complication, with three patients having had two or more infectious episodes. Twelve (36%) patients were hospitalized, and an infectious cause was listed as the primary cause of hospitalization in nine (27%) cases. By comparison, only six (9%) of the 66 matched control subjects required hospitalization for infectious complications after transplantation. The median duration of hospitalization among tourists was 12.5 d (range 1 to 744), with two patients requiring multiple hospitalizations for recurrent infections. Three patients required ICU admission: One was admitted to a hospital in Iran a short period after transplantation for CMV pneumonia and consequently developed respiratory failure; another was hospitalized with Gram-negative sepsis and acute respiratory distress syndrome (patient 1); the third patient ultimately died as result of fulminant hepatic failure after presumably contracting hepatitis B from her donor (patient 4). Ten (30%) patients developed CMV infection after transplantation, and six of these patients were hospitalized as a result. Of the 10 patients with CMV infection, six had CMV viremia alone that responded well to treatment, and they retained stable renal function. A seventh patient developed CMV viremia after a course of lymphocyte-depleting therapy for acute rejection. An eighth patient had mild disease limited to the urinary tract. CMV was considered a contributory cause of interstitial nephritis and resultant graft loss in one case (patient 2). One additional patient developed CMV pneumonia along with bacterial sepsis and ultimately lost his graft (patient 1). None of the 10 patients who developed CMV infection had received prophylaxis at the time of transplantation. Donor CMV status was not provided in any of these cases. In the matched cohort, a markedly lower proportion of patients had reported CMV infections (12%), one of whom developed severe disease that required ICU admission for respiratory failure secondary to CMV pneumonitis. Compared with the matched cohort, there seemed to be a lower incidence of bacterial infections among the tourists; however, many bacterial infections in the matched cohort occurred within the first month after transplantation, and we did not have sufficient data in the first month after transplantation for the tourists. Among the tourists, four (12%) patients developed a bacterial urinary tract infection (UTI). UTI was the primary cause of hospitalization for one of these patients and may have contributed to the development of Gram-negative sepsis in two additional cases. One of these patients subsequently developed a vancomycin-resistant enterococcal perinephric abscess that required surgical intervention. In the matched cohort, there was a higher proportion of UTI (21%), but bacteremia secondary to UTI was seen in only one case and did not result in hemodynamic compromise. There was a single case of pneumonia in the tourist group, reported to occur at the time of transplantation in Iran. The lone kidney-pancreas transplant recipient developed a peripancreatic abscess that required surgical drainage and a prolonged hospitalization. Surgical complications were generally uncommon. Four (12%) tourists had one or more surgically related complications, including lymphocele, ureteric stricture, transplant renal artery stenosis, and a perinephric abscess. There were no reported episodes of urine leaks or acute surgical complications. The disparity between the supply and demand for kidney transplantation remains a preeminent issue in transplantation. The dire implications of this disparity on patient outcomes are clear to both members of the transplant community and the thousands of patients who are waiting for kidney transplantation. As the transplant community struggles to meet the increasing demand for transplantation, some patients have turned to countries outside their country of residence to obtain an organ transplant (3,5–9). The risks and implications of this practice, often termed “transplant tourism,” have been difficult to assess in the United States because of the variable experiences and limited numbers of patients at a single center. In recent years we have noticed an increase in the number of tourists who present for follow-up care at our center after having obtained a transplant abroad, and we were concerned by the seemingly high rate of complications that we observed. We identified 33 California residents during a 10-yr span, most of whom had been evaluated for transplantation at our center, who underwent transplantation abroad and then returned to our center after transplantation for medical follow-up. More than two thirds of tourists whom we identified had received a transplant in the preceding 4 yr, representing a significant increase in recent years. This supports recent data by Merion et al. (8) that indicated a tripling in the number of identified tourists who returned to the United States from 2000 to 2006. We were unable to identify recipients’ reasons for traveling abroad, making it difficult to determine whether longer wait times for transplantation, a reluctance or an inability to pursue living-related donors, or a combination of these and other factors are driving this phenomenon. Who Are Tourists, and Where Do They Go? Compared with patients who underwent transplantation at UCLA, tourists included a larger proportion of Asian-American patients, and most patients traveled to the region of their ethnicity to obtain transplantation. Although this may be a reflection of the large Asian population that resides in Southern California, it is in keeping with other reports on commercial transplantation in North America. In a Canadian series, patients who were born outside Canada (mostly South Asian and East Asian) were more likely to obtain a kidney transplant abroad (7). Similarly, the recent analysis of the United Network for Organ Sharing data found that patients of Asian ethnicity were the largest ethnic group to obtain transplants abroad (8). That most patients traveled to regions of their ethnicity may suggest a greater degree of comfort in traveling to a familiar region to obtain medical care. The cultural issues that may relate to why patients of certain ethnic groups are more or less willing to travel abroad for transplantation is not well understood and warrants further examination. In our analysis, tourists also had a substantially lower mean dialysis time before transplantation compared with patients who underwent transplantation at UCLA, suggesting that many patients may have considered the option of transplantation before initiation of dialysis. This may also reflect a lack of potential living donors or a reluctance to consider family members as living donors, although we have no specific data to address this issue. Most patients traveled to Asia or the Middle East to obtain transplantation, with most traveling to China. Indeed, in the aforementioned report by Merion et al. (8), Asia and the Middle East were the transplanting regions in >60% of identified tourism cases. Living-donor transplants were most common. The lack of documentation from transplanting centers made it difficult to determine accurately how many of the reportedly living-unrelated transplants were performed using organs from vendors; however, the reported prevalence of vendor-driven transplantation in the Middle East and Asia (10,11) may lead us to believe that most of these have been using organs from vendors. In addition, nine deceased-donor transplants were performed in China, with no further information provided regarding the donor, leaving us to presume that executed prisoners were the source of these organs (12,13). Of note, four US residents traveled abroad to receive living-related transplants, including two from siblings. This begs the question, why was it easier for these patients to travel abroad rather than coordinate a transplant in the United States from their related donors? Addressing these limitations may help to facilitate local transplantation for patients with related donors abroad. In our experience, a major source of frustration was the lack of complete documentation from the transplanting center, echoing the sentiments reported in previous such analyses (6,7). Most centers provided information on the date of transplantation, discharge immunosuppression, and the serum creatinine level upon discharge from the hospital. Beyond the provision of a generic donor category, no information was provided regarding the general health, age, or viral status of the donor. Furthermore, few details regarding transplantation, including cold-ischemic time, warm-ischemic time, and HLA matching status, were provided. One-year graft and patient survivals were not statistically different between tourists and all patients who underwent transplantation at UCLA. Given that tourists had the lower risk characteristics of shorter dialysis times and more living-donor transplants, it is difficult to draw firm conclusions from this unadjusted comparison. To compare better the posttransplantation outcomes between tourists and patients who underwent transplantation locally and had similar characteristics, we performed a matched analysis comparing tourists with a cohort of patients who underwent transplantation at UCLA matched for age, race, gender, donor source, and transplant year. Although low event rates limited the statistical power of the matched analysis, there seemed to be a trend toward worse outcomes among tourists. Compared with a single graft loss in the matched cohort, there were four cases of graft loss, including one patient death in the tourist group, suggesting that graft and patient survivals may be inferior among tourists. It is important to recall that we had data only on tourists who ultimately returned for follow-up, potentially excluding patients who died early after transplantation. Variable results regarding graft and patient outcomes have been reported in the past (5,9,14,15). Prasad et al. (7) reported inferior graft and patient survival among recipients of commercial living-donor transplants compared with living-unrelated donor transplants performed in Toronto. Meanwhile, Canales et al. (6) reported a single graft loss and patient death in their series of 10 patients who returned to the United States after undergoing transplantation abroad. In addition, we found that the rate of acute rejection in the first year after transplantation was higher among tourists compared with the matched cohort. This may reflect underimmunosuppression or inconsistent monitoring of immunosuppressive drug levels early after transplantation. There was no documentation relating to immunosuppressive monitoring in our series. We found an increased incidence of severe infectious complications that required hospitalization and ICU management among tourists compared with the matched cohort of patients who underwent transplantation at UCLA. 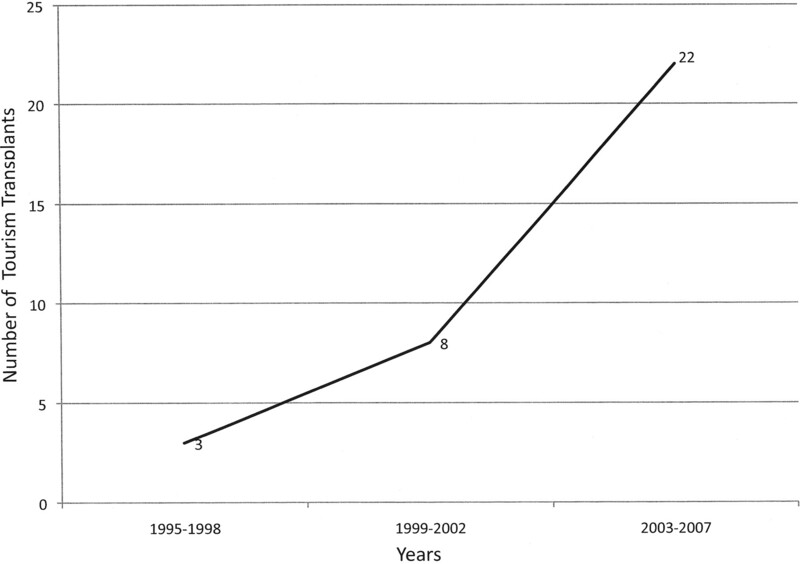 The higher incidence of infectious complications is consistent with previous reports (4,6,7,15,16) and may reflect a series of issues relating to tourism, including the increased complexity of immunosuppressive management during the transition of care from the transplanting center to our center as a result of the lack of communication and information, the lack of infectious prophylaxis administered early after transplantation, the varying infectious disease profiles of different countries, and the unclear mechanism of donor evaluation. CMV infection was much more common among tourists and contributed to significant morbidity in three cases and graft loss in one case. This may not be surprising, because the majority of patients did not receive CMV prophylaxis until they returned to our center. Perhaps routine improved donor screening and routine infectious prophylaxis may have resulted in improved outcomes in these cases. Conversely, routine bacterial infections seemed to be less frequent in the tourism group but were likely underreported in tourists because we first saw tourists an average of 35 d after transplantation. The lone death in our series was attributed to complications from donor-contracted hepatitis B and raises serious concerns regarding the donor selection process. In an examination of characteristics and outcomes among organ vendors in Pakistan, Naqvi et al. (17) reported that 25% of organ vendors identified were positive for hepatitis B or C on follow-up, with nearly 8% reporting a history of jaundice and nearly 30% of infected vendors requiring active treatment. It is unclear what proportion of these vendors were infected before donation, but reports of hepatitis among tourists in previous studies (5,15) and ours suggest that this is a significant issue. Is Transplant Tourism a Public Health Issue? The potential for acquiring infectious diseases that are endemic to different regions of the world through transplant tourism is an important consideration from both a clinical and a public health perspective. The unclear circumstances under which donors are selected and the increase in organ vending practices in certain regions of the world contribute further to this concern. Reports from Turkey and the United Arab Emirates described among tourists infectious complications that were unusual for their respective regions, including tuberculosis, malaria, and aspergillosis (9,15). This highlights the potential impact of transplant tourism on the infectious disease profiles of the countries to which tourists return and clearly indicates a need to examine the impact of transplant tourism from a public health perspective. The safe and ethical practice of transplantation, particularly from living donors, is contingent on a trustworthy doctor–patient relationship (18). The “patient” in this case refers to both the recipient and the living donor. Of the 29 tourists who had been evaluated for transplantation in our center, very few had expressed their plans to travel abroad for transplantation. Furthermore, the details and circumstances surrounding donor selection and transplantation were largely unclear. Detailed discussion regarding the ethical implications of transplant tourism and the concern for the health of donors are beyond the scope of this article and have been the source of discussion in many recent reports and editorials (19–24); however, that this practice undermines trust in the doctor–patient relationship has significant implications for the treatment of returning patients and the maintenance and evolution of the doctor–patient relationship in transplantation. In interpreting these results, readers must consider the limitations that are inherent to retrospective observational studies. We cannot account for a possible selection bias in the analysis of retrospective data, because we have information only on patients who underwent transplantation and ultimately returned to our center. Furthermore, data and outcomes in the first month after transplantation were largely obtained from patient accounts and information provided from the transplanting center, which were often incomplete and may be subject to recall bias. The matched analysis was limited by the relatively small number of tourists, low event rates, and a lack of donor factors provided by the transplanting center. Last, the findings of our experience may be reflective only of our experience and may not be generalizable to other centers or regions in the United States. Transplant tourism seems to be increasing over time, with most patients traveling to regions of their ethnicity. Graft and patient survival do not seem to be significantly worse among tourists who return, but transplantation abroad is associated with a more complex posttransplantation course with a higher rate of acute rejection and increased severity of infectious complications after transplantation. Transplant tourism is a risky option for patients who are awaiting kidney transplantation, and its implications on public health warrant further evaluation.